French Prime Minister Edouard Philippe said Thursday that more than 65,000 police would be deployed to prevent another outbreak of violence during upcoming protests. The announcement was made despite President Emmanuel Macron’s decision Wednesday to abandon a fuel tax hike that has sparked weeks of unrest. Last Saturday, the worst rioting in Paris in decades broke out, with rioters burning cars and looting stores on Paris’ famed Champs-Elysees boulevard. Government officials are concerned that a repeat of Saturday’s violence would weaken the economy and raise doubts about the government’s survival. The Eiffel Tower and museums will be closed Saturday and at least four first-division football matches have been canceled. The protests erupted in November over the fuel tax increase, which was part of Macron’s plan to combat global warming. After Macron scrapped the increase, protesters made new demands to address other economic issues hurting workers, retirees and students. 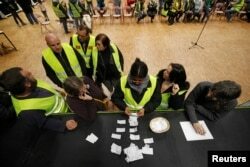 Protesters wearing yellow vests, the symbol of a French protest against higher diesel fuel prices, count ballots as they elect a representative to liaise with other blockade points, in Aubevoye, France, Dec. 6, 2018. Philippe told lawmakers he would consider new measures to help the lowest-paid workers. Finance Minister Bruno Le Maire said he was ready to accelerate tax cuts for households and called for employee bonuses to be tax free. Officials are also concerned about far-right, anarchist and anti-capitalist groups like Black Bloc that have mimicked the “yellow vest” movement. The “yellow vest” movement was named after the safety jackets French motorists are required to keep in their vehicles, which the protesters wear at demonstrations. The weeks of protests have exposed intense resentment among non-city residents who feel that Macron, a former investment banker, is out of touch with struggling middle-class and blue-collar workers.